First, add 3 inches of water to a cup. Next, pour 1/3 cup oil on top. Then, squirt 1 drop of food coloring. What happened?! The food coloring drop will sit on top of the oil. Grab a salt shaker and start sprinkling to get a reaction! 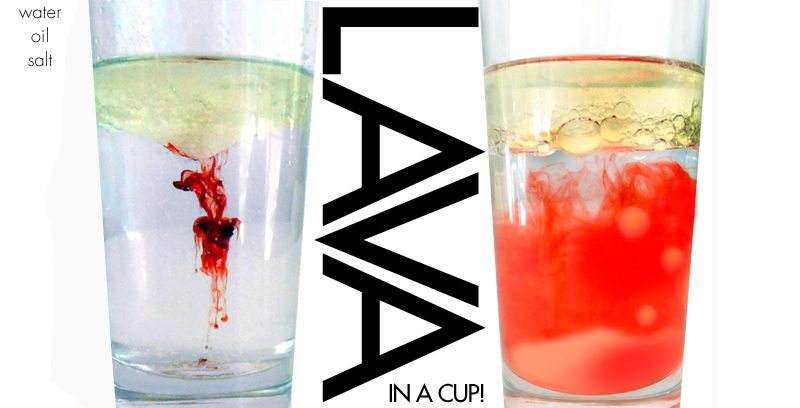 Magically, "lava" will drizzle down and fill the cup! Watch closely and blobs will appear and shoot up to the top of the glass (salt dissolves and heads back to the surface). For the scientific explanation, check out Exploratorium Salt Volcano! For more blob activity pour a tsp of salt in (Science Bob). I read you from Spain. Congrats for your blog! !